The high point in Zak Miller’s running career came a month ago at the Marine Corps Marathon. The 28-year old ran his best marathon to date, finishing in 2:36:02 to place 14th overall in a field of 19,791 runners. It had been a decade earlier when he had last experienced that kind of visceral thrill, winning his Group II race at the indoor 3,200-meter championships while competing with Haddonfield Memorial High School in New Jersey under legendary coach Nick Baker. But in truth, that day on the roads, running just his second marathon, had been far beyond what he ever thought he could do individually. Emotionally, it had been a long road to just get back to this point, to have this kind of success in running again. Just four years earlier, at the low point in his life, he had found himself in jail. After graduating from Haddonfield, he arrived at Kutztown University as a talented freshman runner for the Golden Bears. But that had been long ago. Within a few years, he left school, quitting the track team, and moved to Philadelphia – a stone’s throw away from his home in Haddonfield, but just close enough to hold on to old habits. He had picked up a job at a meat processing plant in North Philadelphia, managing ex-cons in the wean hours of the night. He filed paperwork, watched over employees, and came home at night exhausted. He didn’t really have any direction. He didn’t have a plan. He had been coasting. But then that fateful night, one small traffic stop led to his demise. And now he was in jail, having been arrested after being stopped by police driving on a suspended license, the result of which, he said, of having not paid parking tickets. Small things added up. While it didn’t mark a life spun out of control from drugs or alcohol, it had been a sobering moment. His life was certainly spinning in some way. He had ballooned from 135 pounds at the start of his freshman year to 205 pounds at the age of 24. He had stopped running entirely and had formed unhealthy eating habits. So he sat in that jail cell long and hard that night thinking about the future, thinking about his life, about where it was heading and what he wanted to do with it. Miller’s father, Bryan, had encouraged him to start running at an early age. “He told me my high school coach [Nick Baker] was kind of a legend in New Jersey,” Miller said. And so he did, at the time becoming part of a program which had won eight New Jersey state championships – currently, the team has 13 overall, winning five straight from 2006-10. Miller saw his most individual success in indoors, where he was a standout two-miler. In his state championship group race, he fell behind early, going back to as far as 24th place through two laps. By the finish, though, he had gapped the rest of the field by 50 meters, finishing in 10:11. “I was very good at knowing where I needed to be and controlling my pace and running under control,” Miller said. Beyond the track, though, there was another benefit. Miller started to believe in what running brought to his life. He began to soak in that energy and earned a job at the Haddonfield Running Company selling shoes and talking to customers. When his high school career finally ended, he was headed in the right direction. His career had promise. Ultimately, things didn’t work out at Kutztown. Miller credits his time at Kutztown to being naïve and young, like countless other college-aged kids. Following his exit from college, the immaturity lasted for a few years. Following his arrest, it didn’t take long for Miller to zap out of his funk. He decided on a new plan, one that would see himself moving away from the place that he called home, away from the people who had acted, in small parts, as enablers. Miller applied to a job at Pacers in Silver Spring and moved in with a cousin who lived in Calvert County, Md. 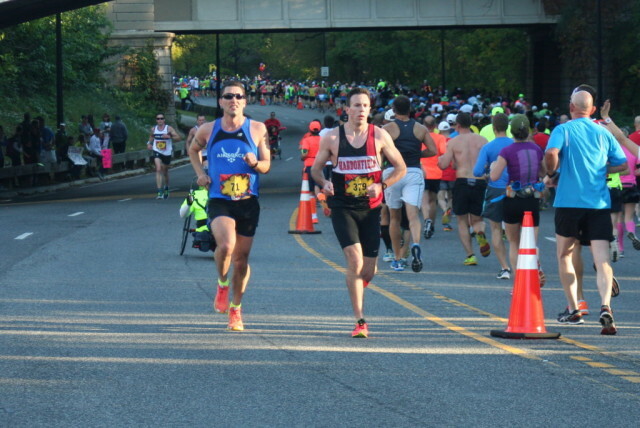 A cousin encouraged him to sign up for a 5K, the Haddonfield Adrenaline 5K, which he did. Still overweight and above 200 pounds, Miller won the race in 16:50. Weeks later, Miller decided to double down. He signed up for the Philadelphia Marathon, a notion, he said, that was supported by his mother, who had cheered at nearly every one of his races. Needing to lose weight, Miller started to eat right, incorporating vegetables and protein into his diet. His first true training week saw him run 40 miles. He was training by himself. At his peak, he had hit 88 miles, and by then, he had lost 30 pounds. Miller went into the race at 175 pounds. More importantly, he had set a goal for himself: 2:42 or bust. The 27-year-old ran a 2:41:50 in his debut. Just weeks after the Marine Corps Marathon, Miller is chowing down on barbecue at Kangaroo Boxing Club in Columbia Heights, looking back on his last few years. After his marathon finish, a local running team had approached him about potentially joining their club. He’s now working at the Georgetown Running Company. And more importantly, he’s just a few credits shy of picking up his bachelor’s degree in psychology. He’s taken classes at the University of Maryland and others at a local community college, looking to finalize his degree. He might even apply for dual-citizenship – his grandmother was Scottish – so he can travel and study some more. Running will continue to be in his life, regardless of where he goes. He even has thought about coaching. He’s thought about guiding others who struggle to help release it through running.